An hour of flight, 4 hours on bus, 30 minutes on boat (and 3 months of anticipation) later, finally–Malapascua! The weather was glorious! no trace of the rain i left behind in Manila. I thought we were lucky but later learned that it’s the case in Malapascua–eternal sunshine. What a paradise! We were welcomed by Matt, dive instructor and partner of Evolution Diving–our home for the next 2 (turned 4) days. Accommodation, paperworks, and lunch were quickly gotten out of the way, so by 2:09 p.m., we took a giant stride into Monad Shoal. Monad Shoal – is the current most famous dive site in Malapascua. It’s a sunken islet 24m below on the edge of a deep drop-off and is known as a cleaning station of thresher sharks. Thresher sharks are identified by their long, thresher like tail that can be as long as their body. They’re active predators and its tail is used to to stun prey (fish, squid, cuttlefish…) But they are not a threat to human. On our first dive here (in the afternoon), were hoping to catch sight of the mantas which usually found later than the thresher sharks, but didn’t. Monad is known for the really early, like 5:30a.m. in the water early dives because this is the time threshers are known to show up. We did that the following day and was rewarded with 12 minutes encounter! It was so graceful and mesmerizes divers keeping low on the shoal. We came back to Monad on our last day . We got there at 7 a.m. just as the other boats were leaving. It was suggested to us that sometimes mastas show up after all the thresher divers leave. We had the shoal all to ourselves. And the thresher shark showed itself again and stayed for 5 minutes. No sign of mantas still and the air divers had to ascend. I was beginning to think that we didn’t have much edge using nitrox over the other divers but we stayed on since we still have about half tank. We were getting a little bored poking at mantis shrimp and chasing octopus when I heard Jojo (our DM) made a sound. We were at the edge of the shoal (where the camera is). I turned to him (certain he saw a manta) and I turned to where he was pointing (behind Beth and Vangie) and saw this huge thresher (about 6 m long) coming towards us! I quickly got both girls’ attention and pointed behind them and we all scrambled backwards! The shark didn’t turn back until it was like 2m away! It then just loomed around looping near the shoal for the next 5 minutes. We were 55 minutes into diving and 5 minutes to deco when it finally moved away and we began our ascend. It was a bit funny now but at that time, my heart was beating real fast yet I dared not breathe too much. Lol. Lighthouse Point is known for the breeding and mating of colorful mandarin fish. The mating takes place at dusk so we went in the water at 6:00p.m. with our torches off (at the beginning of the dive). I’ve never seen them before and I was worried of not seeing them because there were already a couple of boats who arrived ahead of us. But I worry in vain because there were more than plenty for the dive party. We didn’t even have to share as we each have our own staghorn coral bouquet with its resident mandarin fish family. It was a shallow dive of not more than 10m. We spotted a lot of interesting critters, shrimps, snakes as with most night dives. 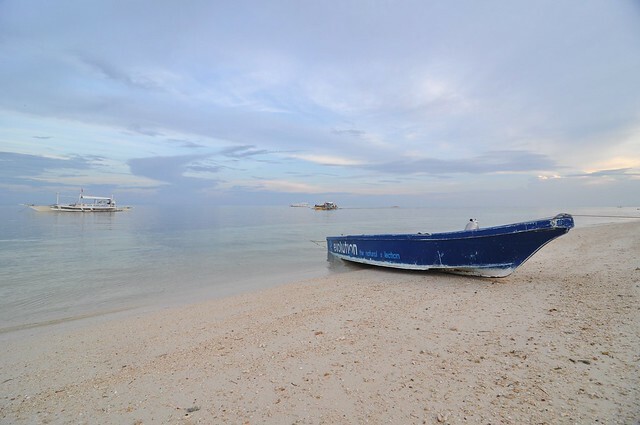 Gato Island – is a protected sanctuary situated 45min boat ride from Malapascua. It has a beautiful coral wall thriving with marine life and caves that’s home to number of white tip sharks. It’s typical to do a 2 dives out day trip with lunch during surface interval. First dive is along the beautiful wall of soft corals with a lot of macro stuff. We’ve spotted different variety of seahorses, a spanish dancer dancing, scorpion fish, and various shrimps, crabs, and critters. Inside a cave were 2 large sleeping sharks (in the exact position 2 days later) unmindful of the poking divers. The 2nd dive is really interesting going through an underwater cave leading to an exit at the opposite end. You need a torch for this dive to illuminate the thousand of fish you otherwise don’t see in the dark. While Gato is beautiful and teeming with marine life, it’s hard not to notice the extent of devastation caused by dynamite fishing (per our DM). There were also evidence of recent damages (uprooted and torn corals) caused perhaps by too much human activity (read: scuba diving). I feel a tad guilty. 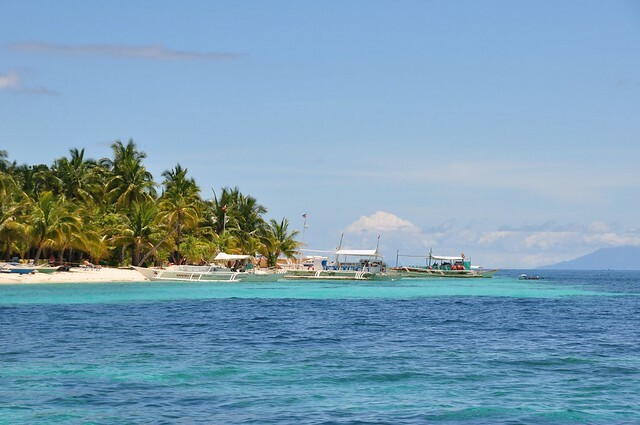 I can’t help compare it to the successful preservation of Apo Island. I think the locals and dive resorts who depend on this natural wonder should take an active part in the conservation effort. Bantigue Point – with no planned dive for the day, as we’re supposed to be out of Malapascua already, we tagged along Matt certifying a student for advance. The dive began at a shallow sandy bottom that doesn’t look very promising at all but turned out to be secret bay 2. It’s here that we spotted 2 (two!) 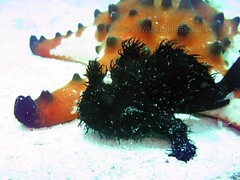 hairy frog fish–a black one and a white one. Doña Marilyn – is a 98-m long passenger ferry which sunk in October 1988 during typhoon Unsang. It now rests 33-m under water on her starboard side about 1.5hours boat ride from Malapascua. We didn’t dive there but I wish we did. Not many people are into wrecks due to poor visibility, murky water and eeriness–the very reason why I find it exciting! I think it will be very interesting to dive recent wreck like Doña Marilyn (vs. WWII wrecks) as it remained unsalvaged, for sure you can still uncover a lot of interesting (maybe spooky) stuff. 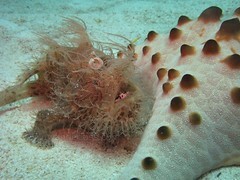 More Malapascua Photos: Underwater + Topside. Naturally there are lots of dive shops in tiny Malapascua and anyone would probably have great diving experience with any shop provided there’s encounter of thresher sharks and preferably mantas too. Evolution Diving is possibly the newest dive shop in the island inaugurated only beginning of 2010. I don’t know how we found them because they don’t turn up very high in google search, but it was an easy decision to go with them because of how personal they replied to our queries. You know that the person replying your mail is the guy you will be diving with and not some secretary-receptionist sending you a template quotation. And we were happy to follow our instinct. Evolution Diving is co-owned and run by business partners Matt and David who are both dive professionals (instructors and technical divers). Their place is nice because it’s so spacious, cozy and laid back, which reflects the nature of the guys. They hang around the restaurant bar—The Craic House chatting and drinking with guests or conducting diving classes. They’re also the ones leading the dives. I love the rinsing area (I’ve said it a few) because it looks like a centerpiece (like a park there), unlike the usual dive shop where they install it in whatever corner that fits preferably invisible. And they have the shiniest new tanks—all of them. It’s easy to see that the guys put all their passion (and dollars) into this. I think most dive addicts at one point or another fantasized of one day giving it all up to run a dive shop in some paradise island. Evolution looks like it. Diving Cost (in Php): Depends on how you negotiate but almost the same rate in most shops. It ranges from 1,000/dive (with your own gear) to 1,400/dive (with rentals). Park Fees of 150 per day. Nitrox at 200 per tank (cheapest in Evolution because they have their own compressor). Gas surcharge for farther sites: Gato is at 350/person, Dona Marilyn maybe 500/person based on 6 or more divers. Where to Stay/Eat: There’s no shortage of resorts around the whole island. Aircon room starts at 2,400 and non-a/c at 1,500 for twin/triple sharing. It’s worthy to mention that eating and drinking is bit expensive in Malapascua because everything has to be brought in from mainland, including drinking water. We were too lazy to go elsewhere so we run a pretty high tab at the Craic House (although food is good), but some of the guys we met eat at a place called Ging-Ging’s where it’s supposed to be the cheapest. Take cab to North Bus Station (Php 75) – they will try to charge you 200 so insists on metered. If you come in group, you can arrange for a van to get you from airport to Maya for 3,000~3,500 and boat from Maya to Malapascua for 500 (per way). I’ve not dived yet since I came back. Wouldn’t mind diving Malapascua. Good luck on your threshers quest. I hope you see the manta too! Are you diving with Evolution? How much are you paying?